Notes: Auchindoun Castle is a 15th-century L-Plan tower castle located in Auchindoun near Dufftown in Moray, Scotland. While there is evidence of prehistoric, probably Pictish earthworks in the grounds of the castle, the remains most visible today are of the castle constructed in the mid-15th century by Robert Cochrane (later to become an Earl of Mar (1458-79). It was passed to the Clan Ogilvy in 1489 and from them to the Clan Gordon in 1535. An extension is known to have been added in the 16th century by the Gordons before the Ogilvys reclaimed it in 1594, it having been destroyed by the Clan MacKintosh in 1592 in retaliation for the 6th Earl George Gordon, 1st Marquess of Huntly's killing of The Bonny Earl O'Moray, their ally. Following the Restoration of Charles II, the castle was again awarded to the Marquis of Huntly. In 1689, during the first Jacobite rising, the castle was used as a temporary headquarters (on 6-7 June 1689) by Viscount Dundee and his Jacobite army. However, the castle was derelict by 1725. 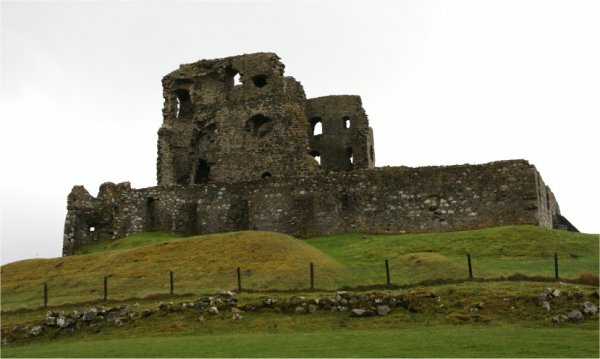 Stones taken from the castle have been used in local farm buildings and nearby Balvenie Castle. While standing, the castle had a large central tower and high curtain wall. Supporting buildings including a stable, brewery and bakery stood inside the wall. A second round tower guarded the northwest corner of the compound. Cellars and possibly dungeons were dug directly into the bedrock beneath the tower. Today much of the curtain wall and some of the outbuildings remain, but the central tower itself is very dilapidated. The ruins of the castle are in the care of Historic Scotland, but were for many years in too dangerous a condition to be open to the public. On the completion of consolidation works, Auchindoun was re-opened for public viewing in November 2007. The sacking of Auchindoun by the Clan MacKintosh inspired a traditional song, "The Burning of Auchindoun" (lyrics courtesy of the Digital Tradition Folk Music Database), Child Ballad 183, "Willie MacIntosh".